Kelly Johnson was the aircraft designer behind some of the world's most remarkable planes including the legendary SR-71 Blackbird and the first real stealth fighter, the F-117. One of the very first designs he played a main role in was equally unusual looking and quite successful in its own right: the P-38 Lighting. This twin engine, twin boom plane was the only US aircraft to be in production throughout the US involvement in World War II. It fought in the European and Pacific theaters. In the Pacific, it was credited with more kills than any other USAAF fighter. 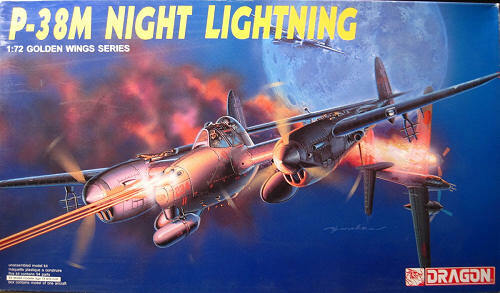 The P-38M was an attempt to make a capable night fighter out of the Lightning. A jump seat was fitted under a bubble hood just behind the pilot's seat. A small radar set was fitted in a pod under the nose, and an equally small radar operator was needed to squeeze into the second seat. So far as I can tell, these P-38Ms were deployed right at the end of WW2, but didn't see any actual combat. This is a neat kit from Dragon. It seems to be laid out pretty logically and although well moulded and generally pretty crisp, my example has a few areas that will need clean up, not least the cockpit floor and wheels. My experience with Dragon kits has generally been a little better than this one, but that said it is nothing a few minutes of minor effort won't remedy. The canopy is nice and clear although mine has a prominent hair-line scratch too. I'm not fussed but it was a bit of a surprise, especially as everything is nicely and separately bagged. 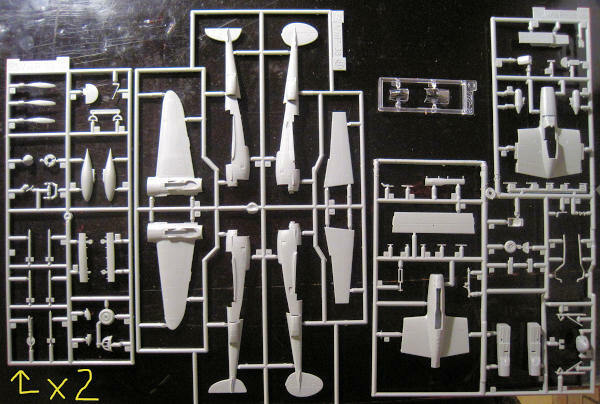 The kit includes underwing rockets though I am not sure if they would have been used in the air to air role? I am not much of an authority on such things! Propellers are individual blades which must be attached to t he spinners. Two fuel tanks are included. Cockpit detail is pretty basic. The decals are clean and nicely done by Cartograf, copyrighted 2008 so they are pretty recent. They are marked 5019-02 so perhaps this is a second edition. There appears to be only one aeroplane's markings but I guess with so few built and all looking the same, that is no problem. I bought this to participate in the 2011 MM WW2 Twins group build. Not normally much of a WW2 modeller, I thought this one looked a bit quirky. If you are really into P-38s I think this would be a good basis (without knowing how accurate it is, it seems to resemble a Lightning). The cockpit detail is very basic and with that big canopy, some extra detail would be good. But I like it and think it will be a fun and fairly straightforward build.